I say zanzoken would play a major in role in that fight. Too bad it ain't gonna happen. 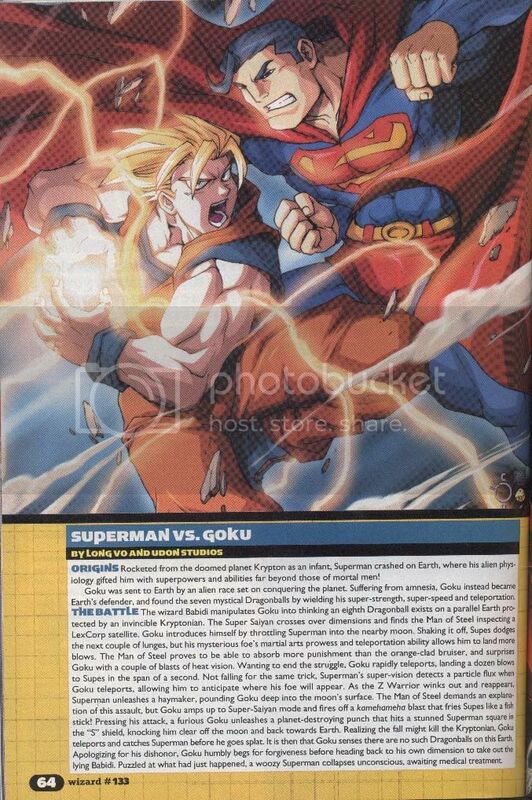 If were going off the comics, theres no way Goku could beat Superman to be honest. MASSIVE thread on this ages ago at the BFP forums. Superman is invulnerable you can't damage him no matter how much you throw at him. Also he spent lloyd knows how many years inside the core of the sun to charge himself so he retains his power, even in redsun solar systems. Charging also helps him avoid power depletion, something Goku can't do. Supes could simply bear hug Goku, and take him straight into the core of the sun, pretty much in the blink of an eye. He can fly at the speed of light, he can travel so fast he can travel backwards in time. Goku's no match for him there even with his instant transmission. RaiDer wrote : If were going off the comics, theres no way Goku could beat Superman to be honest. MASSIVE thread on this ages ago at the BFP forums. Superman is invulnerable you can't damage him no matter how much you throw at him. Also he spent g0d knows how many years inside the core of the sun to charge himself so he retains his power, even in redsun solar systems. So Superman's best shot would be to take Goku to the core of the sun. Although Goku IS stronger, faster, has quicker reaction time, better techniques, Superman has durability and intelligence. And yes Andres1 Goku can blow up the dammed sun he just teleports somewhere safe and destroyes the sun. Let`s say Supes is invulnerable to even the explosion of milions of planets as big as the sun.He beats Goku lots of times but Goku comes back twice as stronger every time till` his punches do more damage than the explosion of those milions of planets as big as the sun bang Supes has no chance. Not after every battle. Only when healing from seveare injury. There is a flaw in the "goku blows up sun and instant transmitions away" theory though. Goku needs time to locate the KI of the person he is goint to. He needs to locate the exact spot. Before he does that the sun is allready long gone. Now before you say "Cell games". Yes he did teleport with his kamehameha in his hands. But Cell was in fact stronger than him and really close by. You don't need 3 seconds to notice such an huge energy while standing near it. spyxter wrote : So Superman's best shot would be to take Goku to the core of the sun. Goku maybe stronger but, he is definitely not faster, Supes can fly at the speed of light. Yes Goku has instant transmisson, but he can't actually move in flight that fast. Goku could keep throwing Ki attacks and tire himself out, Supes remains on form with Goku weak and in his normal state, even just weakened Supes could take him out. Goku's power is limited Supermans is not. Superman is invulnerable dude, that is his major power.. You can't hurt him, how can you beat someone you can't hurt? Even if Goku did do battle with Supes and they both live to fight another day.. Were making up storylines here which isn't the way to go about this. One fight hand to hand till death. But lets say they did fight and they fought again after, sure Goku would be stronger but the fact remains, you can't hurt Superman. Nearly forgot, randomly found this the other day in an unrelated image search. Goku's physical strength isn't greater than Superman's either. Superman would be able to beat Goku before he'd have time to throw a punch or a KI-attack. Azurite wrote : Goku's physical strength isn't greater than Superman's either. Yea and Goku is really going to destroy the sun, provided his physic skills pick up on Supermans thoughts.. Kill our planet in order to beat Supes.. Goku? Do that? I don't think so. Who said Superman can't control his speed!? Or sustain it for a long time, are you making stuff up here or what!? In hand to hand combat no sneeky tricks or silly what ifs, just a chars skills vs a chars skills, Goku will not beat Superman. Nice, tho the storyline makes me *laughing out loud*. This disucussion is absolutely pointless if you talk without fixing the variables. Goku of which saga and Superman of which multiverse. The outcome also depends on who is the writer. We can also cancel out our function of "who wins: superman vs goku" to a simplier "anime/manga-freaks vs comic-book-geeks"
AligBorat wrote : if superman is invulnerable..then why does he say awww when he gets punched into a wall or something? Superman would win hands down as long as they take powers given by the creators into account and no fanfiction nor wishful thinking. Azurite wrote : Superman would win hands down as long as they take powers given by the creators into account and no fanfiction nor wishful thinking. At the state Goku is in GT or at the end of DBZ yes he would but let`s not forget that after each battle or serious injury Goku grows stronger. Why would you even add kryptonite into the discussion? It's a vs. fight with Superman, you wouldn't add kryptonite since with that anyone could win.